Fluoride is a compound that contains fluorine, a natural element. Using small amounts of fluoride on a routine basis can help prevent tooth decay. In areas where fluoride does not occur naturally, it may be added to community water supplies. Research shows that community water fluoridation has lowered decay rates by over 50 percent, which means that fewer children grow up with cavities. Fluoride can be found as an active ingredient in many dental products such as toothpaste, mouth rinse, gels, and varnish. How does fluoride prevent cavities? Fluoride inhibits loss of minerals from tooth enamel and encourages remineralization (strengthening areas that are weakened and beginning to develop cavities). Fluoride also affects bacteria that cause cavities, discouraging acid attacks that break down the tooth. Risk for decay is reduced even more when fluoride is combined with a healthy diet and good oral hygiene. Using fluoride for the prevention and control of decay is proven to be both safe and effective. Nevertheless, products containing fluoride should be stored out of reach of young children. Too much fluoride could cause fluorosis of developing permanent teeth. Topical fluoride is a preventative agent applied to tooth enamel. It comes in a number of different forms. A dental professional places gels or foams in trays that are held against teeth for up to 4 minutes. Fluoride varnish is brushed or “painted” on the enamel. Varnish is especially useful for young patients and those with special needs who may not tolerate fluoride trays. 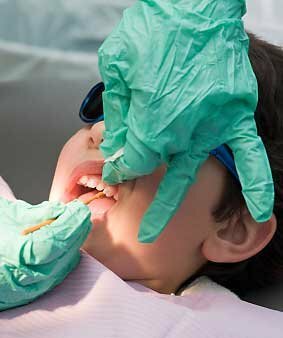 Can my child eat and drink right away after a fluoride treatment? With a fluoride varnish treatment, your child can eat and drink right away. For 6 hours following the treatment, he/she should not have any hot food or drinks (like soup or hot chocolate) that might melt the fluoride, or crunchy foods (like chips or apples) that might scrape it off. He/she should also not brush or floss for 6 hours. With a fluoride gel/foam treatment, your child cannot eat or drink anything for 30 minutes. Facebook Created with Sketch. Youtube-black Created with Sketch.